Gladiator is one of my favorite movies of all time. I have kind of always wished it could be a true story, just because it’s so awesome. I still get chills when I hear Russel Crowe say, “My name is Maximus Decimus Meridius, commander of the Armies of the North…” Seriously, goosebumps. A while back, Zach and I found ourselves burning the candle at both ends, professionally and personally, and decided to take a break for a few weeks, take the kids to Europe, and try to regain our focus. We had a lot of family in Europe and decided to spend that time seeing as much as possible, and maybe even trying a few cosplays with the children. My sister-in-law suggested that we might try Gladiator if we made it to Rome, and that was all the inspiration I needed (there was a moment of self-doubt and concern that Gladiator might actually be a dark theme for a one-year-old, but the obsessed-with-the-idea-of-a-tiny-Gladiator part won out). 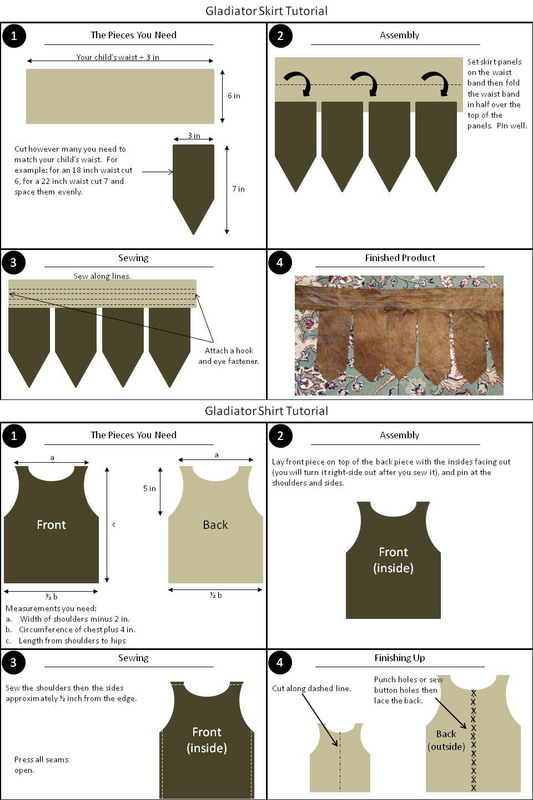 Costuming our Gladiator: I actually made this costume from start to finish in about ten minutes, so it wasn’t the highest quality thing I’ve ever sewn, but it WAS super fast and easy, so I am including a bit of a tutorial below the photos for easy reproduction. My sister-in-law helped me out at the last minute, bringing a remnant of red fabric, and two medallions she retrieved from broken shower curtain hooks. We super-glued them on to the shirt portion to make a cape. As another last minute addition, we toga-wrapped my daughter in a sheet, and had her place a wreath of leaves that we jerry-rigged with some wire on our little champion. Location: the Colosseum, while amazing, wouldn’t be a very practical cosplay and photo shoot location, even if the stars had aligned and we could have made the pilgrimage to Rome. There is, however, a really amazing Roman amphitheater in Trier, Germany– the largest surviving one outside Rome, if I remember correctly– and it was along the path we planned to drive as we visited our families. There were a few tourists, but the area is so large, and there is so much open space that it was quite perfect for letting our little Gladiator run around freely, play-fight a tiger, and explore. Speaking of the tiger, this is a must have prop for any Gladiator cosplay! For this photo shoot we created a custom gladiator lightroom preset. You can purchase and download all of my lightroom presets and other time saving photography resources and add ons from my etsy shop. What kind of fabric is the costume? It is a thin faux leather. I got it at Joann’s a few years ago.